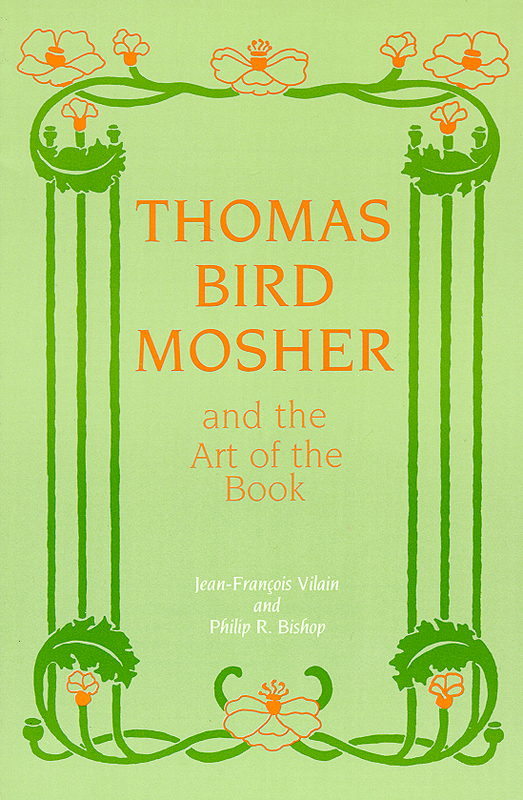 The publications of Thomas Bird Mosher have turned up in public exhibitions over the decades both during Mosher’s lifetime and up to the present day. The first major exhibition to include Mosher’s books was the 1901 Pan-American Exposition in Buffalo, and the second was the 1904 Louisiana Purchase Exposition at St. Louis. Both of these expositions displayed the binding work of Otto Zahn, a binder who frequently liked to finely bind choice examples of The Mosher Books. 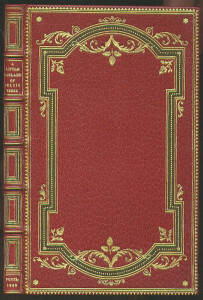 Zahn’s binding of Wine, Women and Song (1899) won the highest award at Buffalo, while the honorary bindings in the second exposition were chronicled in Zahn’s accompanying monograph, On Art Binding, which photo-featured two of Mosher’s publications. Incidentally, a much smaller exhibition featuring Mosher’s books in bindings was held at Minneapolis in 1903. 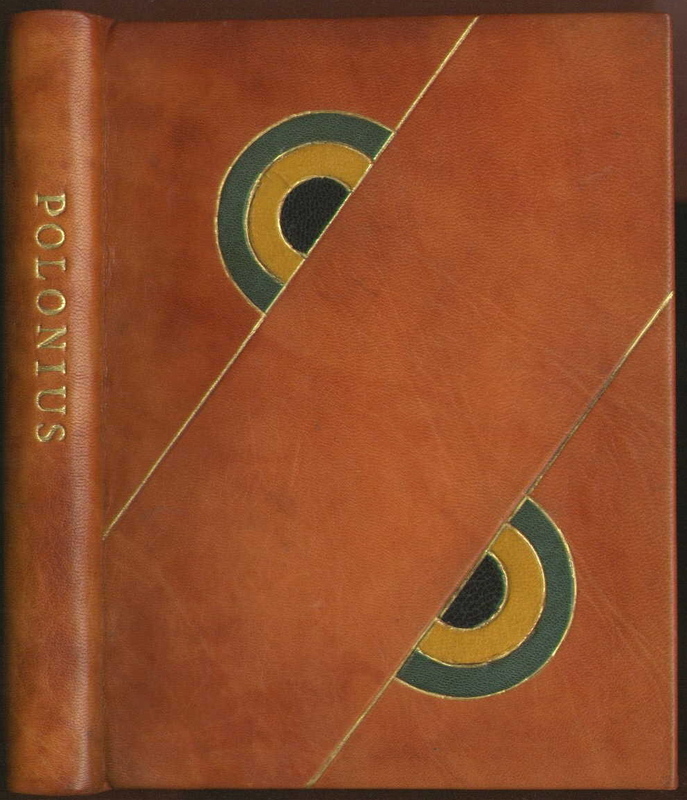 The next major showing was at the 1906 Grolier Club exhibit entitled “An Exhibition of Some of the Latest Artistic Bindings Done at the Club Bindery.” Of the 138 bindings exhibited, eight were on Mosher Press publications (more than any other publisher or printer represented). 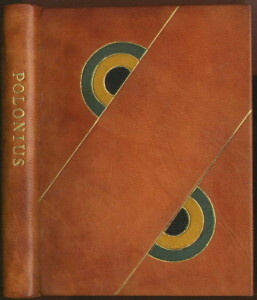 Four Mosher books in special bindings were also exhibited at the Rowfant Club of Cleveland in April 1909. Mosher also received recognition in Elmer Adler’s “Exhibition of the History of the Art of Printing: 1450-1920” held in 1920 at The Memorial Art Gallery in Rochester, New York. The 1972 exhibit organized by the Art Museum of Princeton University and The Art Institute of Chicago, “The Arts and Crafts Movement in America 1876-1916,” featured the Mosher book, Fancy’s Following (1900). And in 1979 Laurie Crichton curated the exhibit, “Book Decoration in America 1890-1910” at the Chapin Library of Williams College. 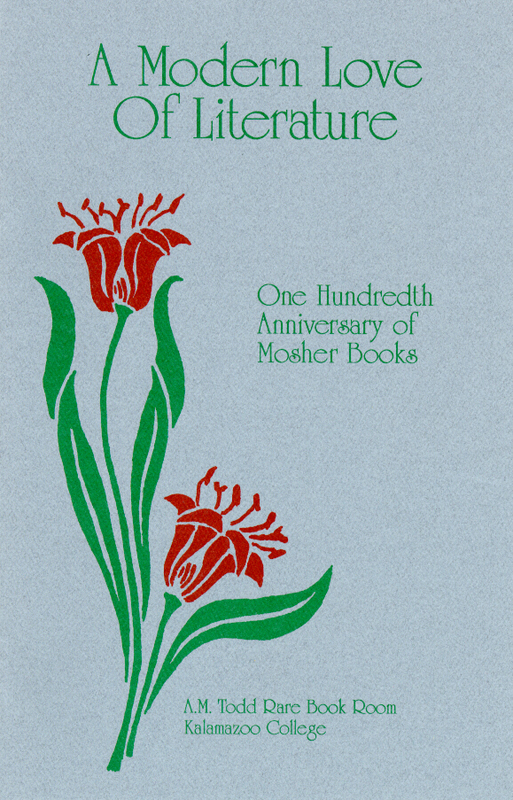 Eleven of Mosher’s books were shown with the first serious emphasis being given to the designers behind The Mosher Books. Ten Mosher titles are also listed in the seventy-page exhibit catalogue for the 1980 exhibit “William Morris in Private Press and Limited Edition” which was held at the General Library, University of Missouri-Kansas City, guest curated by John J. Walsdorf, Jr.
Two more exhibits known to include Mosher books were both held in 1996 at The Craftsman Farms Foundation in Parsippany, NJ. 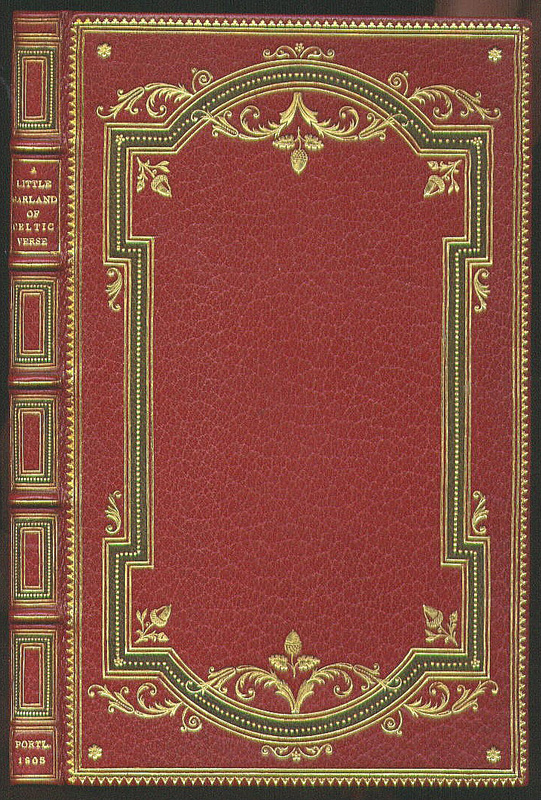 One particularly fine binding by Elizabeth Utley on The Blessed Damozel (1901) appeared in “Women’s Work: The Role of Women in the Arts and Crafts Movement” from July 7-October 6, curated by Suzanne Perrault. The other exhibit, curated by David Lowden, was entitled “William Morris and the Printed Page: English Influence on American Book Design” from September 8-October 27, and featured four works from The Mosher Press. 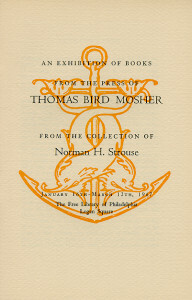 The most recent full exhibit of The Mosher Books is “The Norman H. Strouse Collection of Books Published by Thomas Bird Mosher” held at the University of San Francisco from June 23-September 25, 1998. It includes 17 cases (arranged chronologically) of books published by Mosher, books published by The Mosher Press after 1923, Mosher’s book catalogues, ephemera, books from Mosher’s library, correspondence, and other manuscripts (13 of the 17 cases shown in above link). Calvert’s Ten Spiritual Designs (1913) was selected for the Grolier Club exhibit “A Century for the Century” (Sept. 15 to Nov. 13, 1999) as one of the top 100 finely printed books of this century. This exhibit, curated by Jerry Kelly and Martin Hutner, includes selections from England, Europe and America. The Ten Spiritual Designs was again chosen as one of eight Mosher items on display at the Grolier Club’s exhibition “Illustrating the Good Life — The Pissarros’ Eragny Press, 1894-1914” held February 21 – April 28, 2007, in which the Mosher Press is shown to be a major conduit displaying Eragny Press designs to book buyers in America. A revised form of “Illustrating the Good Life…” was at Brown University’s John Hay Library, Sept. 4-Oct. 26, 2007 and included three Mosher books. The exhibition then traveled to The Sacramento Public Library for opening on January 11. “Few, But Roses: Classical Texts & Fine Printing in the 20th Century” (Oct. 25, 1999 to Jan. 2000) was presented at Trinity College in Hartford, CT. The exhibit is curated by Alesandra Schmidt Woodhouse who chose Mosher’s edition of The Eclogues by Virgil (1912) as one of America’s fine press contributions. Additionally, in commemoration of the return of a traveling exhibit, the Delaware Art Museum has mounted “The Return of the Pre-Raphaelites” from September 23, 2007 until whenever. 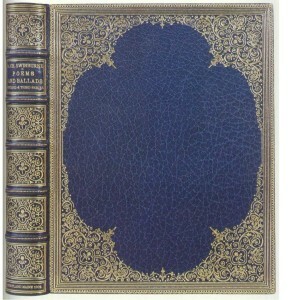 The Mosher Press copy of The Germ (1898) is “used to open a discussion of Pre-Raphaelite illustration” by displaying William Holman Hunt’s two-page illustration which accompanies a poem by Thomas Woolner. Muse Selection of the Month for October 2002 at the Gould Library at Carleton College (Northfield, MN) presents a sampling of Mosher’s work from their Special Collections. 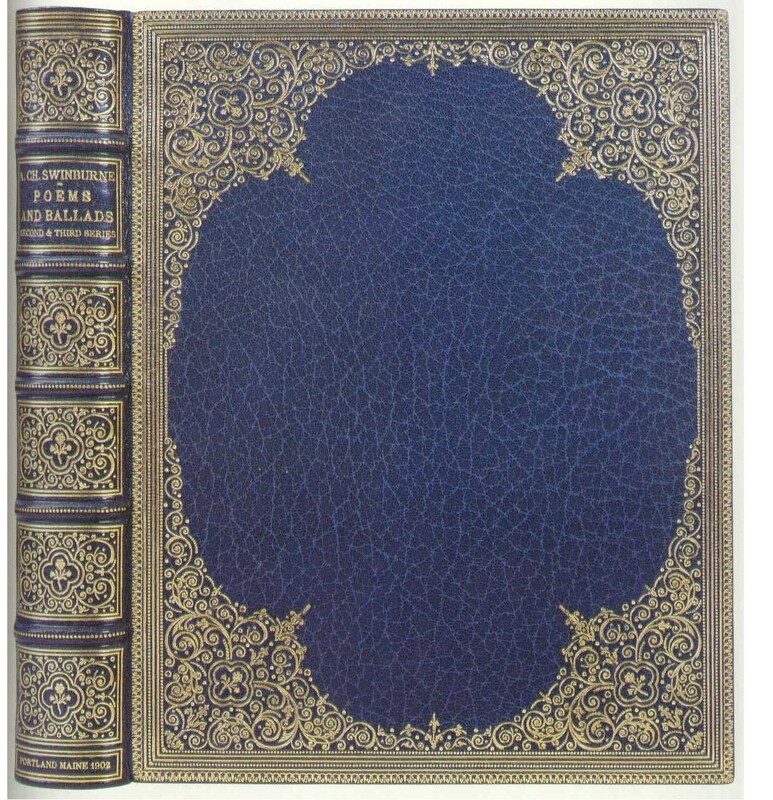 Bound to the Best–The Club Bindery, 1895-1908. Held at the Grolier Club in New York from Sept. 15 to Nov. 20, 2004, this exhibition included two Mosher books in Club bindings: Swinburne’s Poems and Ballads (1902, entry #30) and A Little Garland of Celtic Verse (1905, entry # 33). The books are also pictured in the exhibition catalogue Bound to be the Best-The Club Bindery. Catalogue of an Exhibition at The Grolier Club by Thomas G. Boss with an Essay by Martin Antonetti. Boston: Thomas G. Boss Fine Books, 2004. To read a personal view on the opening night’s festivities, see Bishop’s essay. A talk on Mosher was given to the Manchester Bibliographical Society in Manchester, England on March 17, 2008 by fellow of the John Rylands Research Institute, Brenda J. Scragg. Her PowerPoint presentation entitled “The Books of Thomas Bird Mosher: an American private press publisher at the turn of the 19th century” introduced Mosher’s books and their designs, and credits the Mosher Press bibliography and the Mosher Press website for some of the presentation’s contents. Authors used, books published in the various series, and some biographical information were presented, but the preponderance of the show was devoted to book design. Decorative papers were also identified via the Schmoller Collection of Decorated Papers at Manchester Metropolitan University. Two exhibitions in the first half of 2016 presented books from the Mosher Press, one as part of the Penn Libraries exhibition of color in private and fine press books in their “Across the Spectrum” exhibit from February to May, and the other being the “New Members Collect” Exhibition at the Grolier Club, June through July. Both are covered here. “The Prince and the Pirate–Thomas Bird Mosher, American Publisher” presented to the Pittsburgh Bibliophiles on March 17, 1994 at the Hillman Library at the University of Pittsburgh. 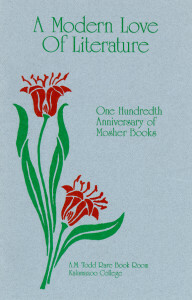 “The Mosher Books in Some of Their Graphical Aspects” presented to the Philobiblon Club on May 9, 2000 at the Franklin Inn Club in Philadelphia, with accompanying printed keepsake. 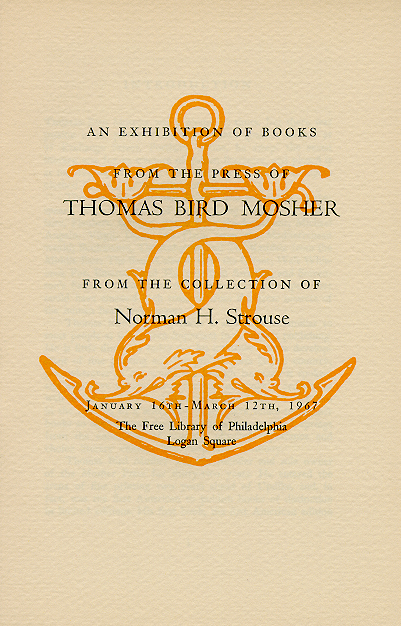 “Some Stylistic Elements of the Books of Thomas Bird Mosher” presented at the Typophiles Luncheon on June 14, 2000 at the National Arts Club in New York City, with accompanying printed keepsake, and later culminating in a Typophiles monograph entitled “A BR QUARTET–Letters from Bruce Rogers to Thomas Bird Mosher at the Houghton Library” New Series, No. 17 (NY: Typophiles, 2001). 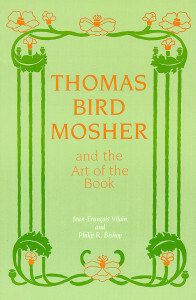 “Thomas Bird Mosher and the Mosher Books as seen through The Bishop Collection” which was accompanied by a keepsake commemorating the talk. Bishop gave a well received, rather dynamic PowerPoint presentation to The Baxter Society (Maine’s only book club) on May 14th, 2008. “THE BIBELOT – Thomas Bird Mosher’s Vision of Introduction” was a PowerPoint lecture held at The Grolier Club on March 13, 2013 in addition to Bishop’s participation in the following Collectors’ Forum with fellow panelists Mark Samuels Lasner (moderator), David Lowden, Jean-Francois Vilain, and Susan Barribeau. If other exhibits, unlisted here, included The Mosher Books as part or the whole of the exhibit, please kindly forward detailed information to the website presenter, Philip R. Bishop at mosher@ptd.net.